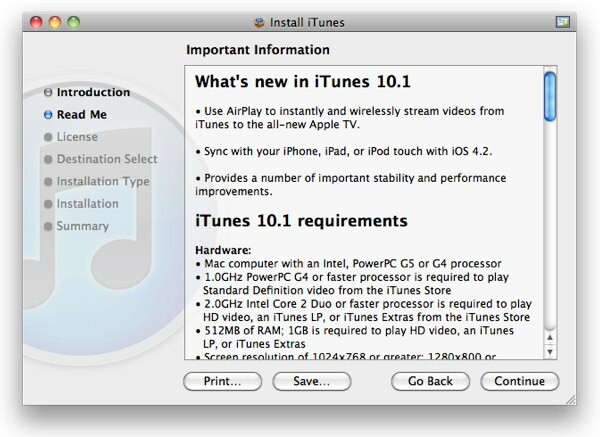 Here’s iTunes 10.1. Next stop? iOS 4.2. If your copy of iTunes isn’t pushing the update, you can head to Apple’s page where it’ll be there, waiting for you. In addition to paving way for the new iOS, iTunes 10.1 adds the much anticipated video AirPlay feature, so fire up that Apple TV and push yourself some vids! Upgraded APPLE TV to 4.1 and downloading 4.2.1 for iPad. It will make it alot more useful. I’m really looking forward to seeing a review on how well Air Play works and what apps exactly are allowed to use Air Play.